For retailers, the jingle of the cash register bell is merry and bright during the holiday season. This is the time of year when many businesses make the majority of their sales, and shoppers flood local shops and malls to find the perfect gift. 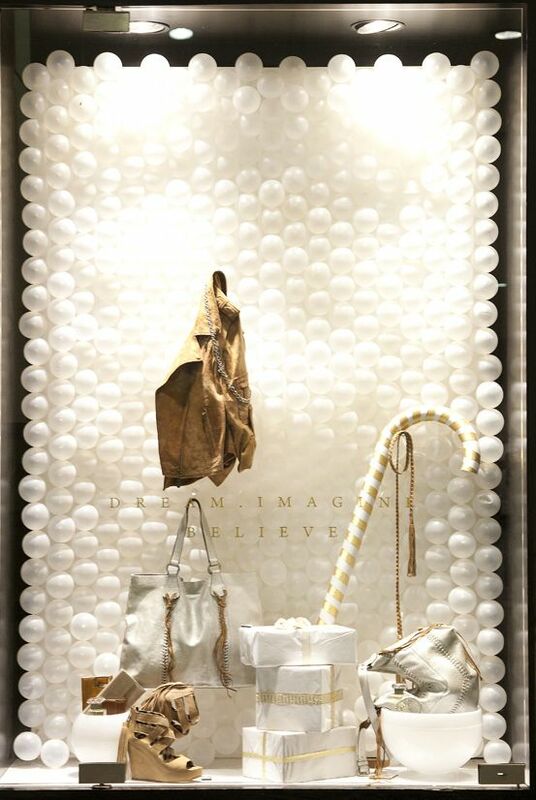 A joyful and eye-catching window display encourages shoppers to enter the store. With this in mind, we’ve pulled together 25 of the most insanely creative holiday window displays we could find from around the world, along with expert tips to help you build the perfect display this holiday season. May your holidays be filled with peace and joy – and may the register bell ring brightly! 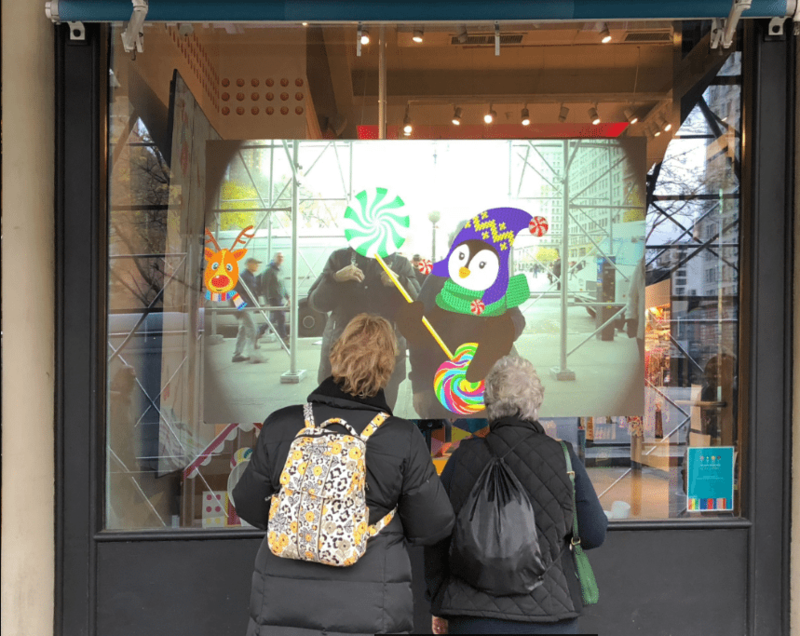 As all the large retailers unveil their big-budget holiday window displays, Vistaprint worked with a team of art and design students to design and create Brooklyn Artery’s window display in one day at a cost of just $347. This is the average amount small shopkeepers spend decorating their storefront windows, according to a Vistaprint survey conducted this month. Vistaprint managed to come up with a 3-dimensional display depicting a whimsical Christmas evening in the city. It’s complete with simple white silhouettes of Brooklyn row houses and stars accented with simple colorful outlines. The display is framed by bright white lights to recreate that white Christmas in the city that passersby will enjoy. DZD created this concept of mirror garlands for their Christmas display to give it a snow storm effect. They used thousands of garlands of hexagonal mirrors which were held in place by nylon thread and tiny beads. The lights bouncing off the mirrors make them look like snowflakes and lend an elegant touch that matches the outfits on display. We+ created this window display design called “surprise” for Seibu-Shibuya. The idea is similar to an advent calendar. They came up with segmented displays each covered with red linen cloth, and everyday a different segment will open up to reveal little displays framed by knitted tapestries. Outernets is an interactive window display company that transforms storefronts into personalized ads. The displays pitch products and offerings depending on who is looking at it (based on age, gender, etc). For example, if a child walks by, images of toys can be projected onto the windows. Stores can stand out this Christmas by having these displays interact with customers as they walk by, while combining their products with fun Holiday designs. 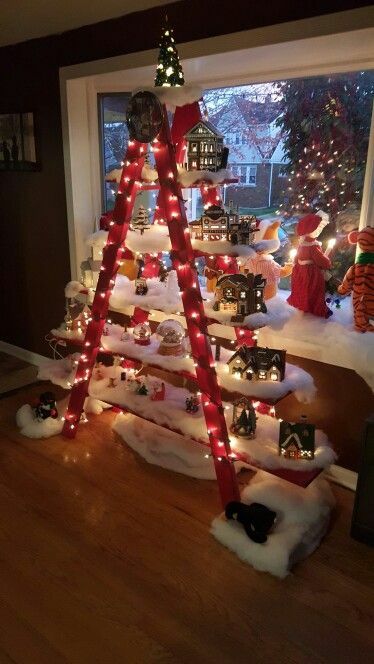 The mitten tree demonstrates creative retailing at its best. Old-fashioned mittens, some appliqued with country-themed patches, adorn a tree-shaped form with wood peeking out from the trunk of the tree. The theme speaks of snow, childhood memories, and old-fashioned charm in an understated and rustic way. The tree form could be used to sell actual pairs of mittens, as well as other winter accessories such as scarves and hats. 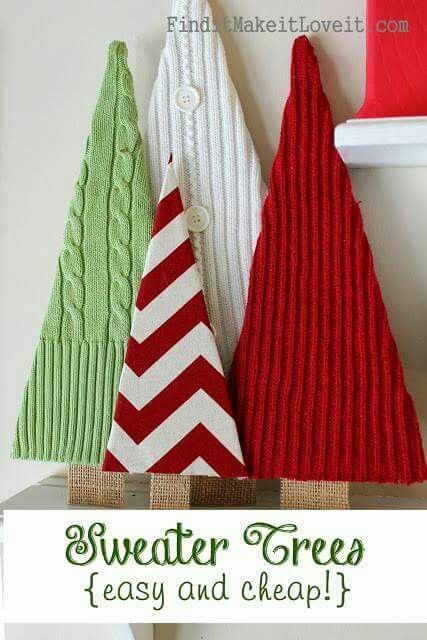 Like the mitten trees, these sweater trees would make an adorable Christmas display for a clothing retailer. The tree-shaped forms underneath can be cut from cardboard or plywood. Just be sure to pin the sweaters gently over the forms so that they aren’t stretched! 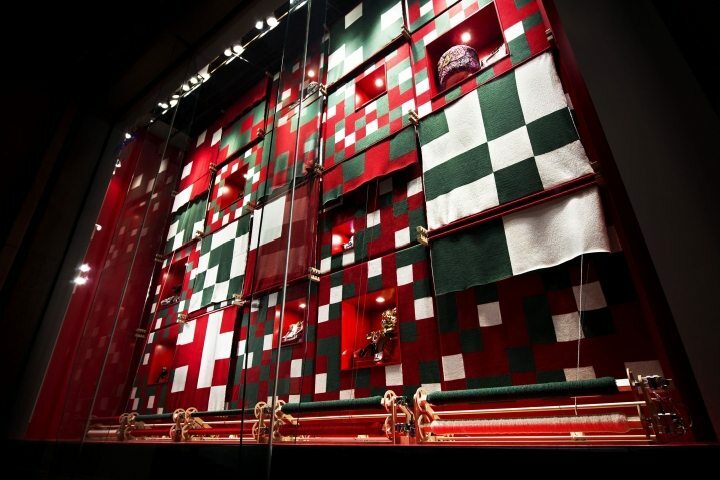 Green, red and white symbolize the holidays while utilizing merchandise for the display. Silver and gold glitter in a winter wonderland created with plain white tree ornaments affixed together like pearls on a string. The glittering backdrop is echoed by the white and gold candy cane and the gold in the front and white-wrapped presents. The colors and materials speak of understated luxury. Trees feature prominently in retail stores, and for good reason: they make use of the vertical space within stores and place items at eye level in an appealing and attractive holiday theme. 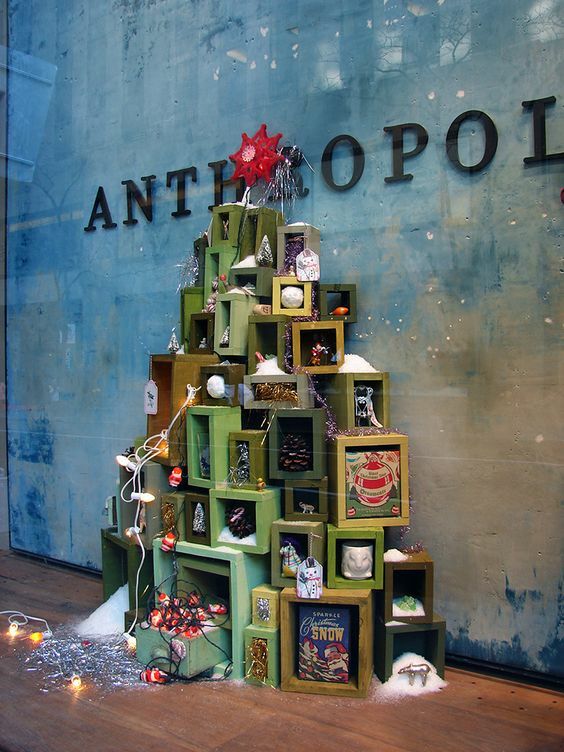 The rustic green boxes underscore Anthropologie’s visual branding and merchandising, while each box contains holiday decor or other items to purchase. Tree shapes can be created from nearly anything, as this modern ornament pole attests! A thick center pole with a ring at the top is hung with green cords ending with ornaments to form a tree. The eye-catching, glittering and modern tree brings attention to the clothing mannequin at the right and to the area of the store where this holiday display stands. For those with small restaurants, diners, coffee houses, bakeries and food retail, this charming display can help you upsell mugs to go along with gourmet coffee and tea items. Galvanized trays are stacked and glued on small pipes cut to size with a small finial at the top to polish it off. 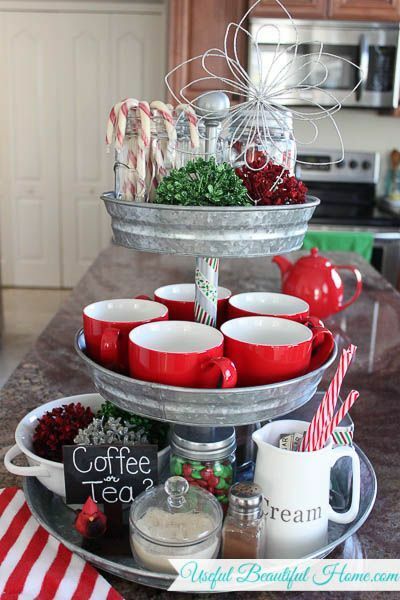 Red mugs, candy canes, and other items can be stacked inside for a quick countertop display. Here’s another clever idea that maximizes wall space while showcasing products. 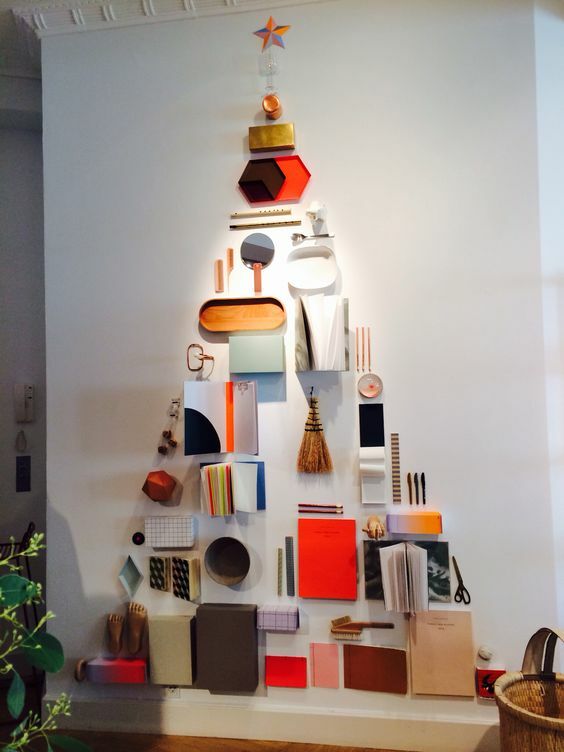 This adorable tree is made up of products from within the store: whisk brooms, scissors, notebooks. It’s a great idea for home stores, kitchen supply and culinary stores, restaurants, stationary shops, and card shops too. 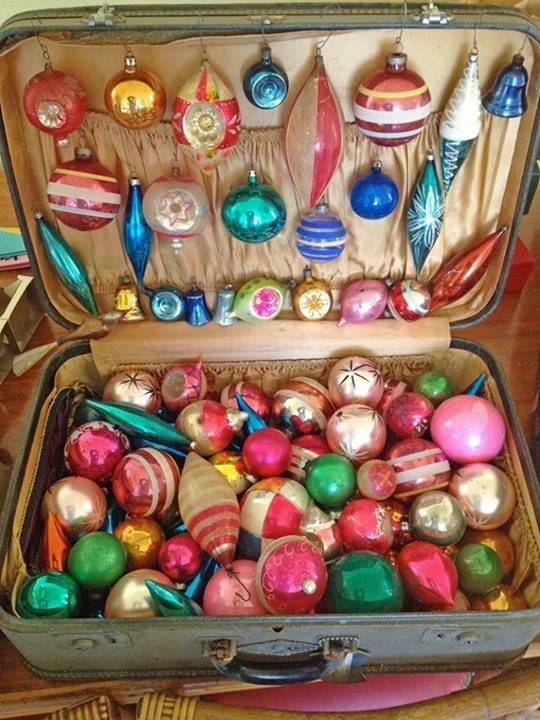 Vintage suitcases make great tabletop display pieces for ornaments, earrings, jewelry and other small items. The satin interior already looks elegant, while the worn exterior hearkens to older times. You can spray paint the exterior with glittery gold, silver, red, or green paint to make it more festive. 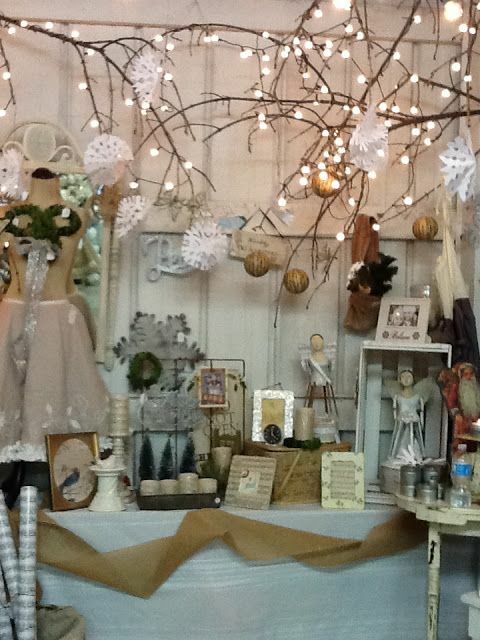 This charming display of vintage reproduction ornaments is perfect for a retail gift shop. Have a theme, and stick to it…this country Christmas theme uses natural products such as tree branches, hand-scissored snowflakes, white spray painted crates, white linen tablecloth, and burlap strips for a charming rustic theme. The display showcases the picture frames and other gift items for sale without overwhelming them. If you can make gingerbread houses, there’s no reason not to go big and make a faux gingerbread city scape for Christmas using foam board, hot glue, latex caulk and plastic candy. 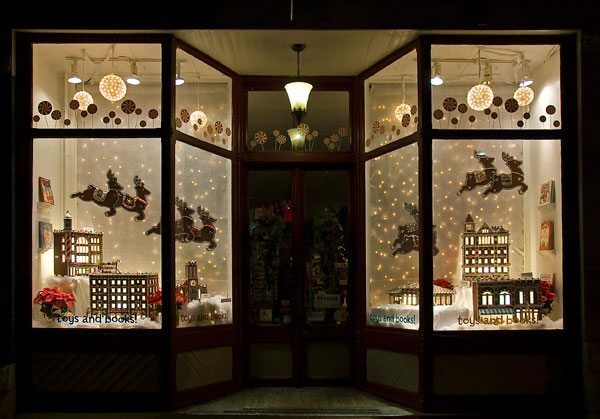 The owner of Pufferbellies toys & books store, along with friends, created this window display after photographing buildings they wanted to feature. 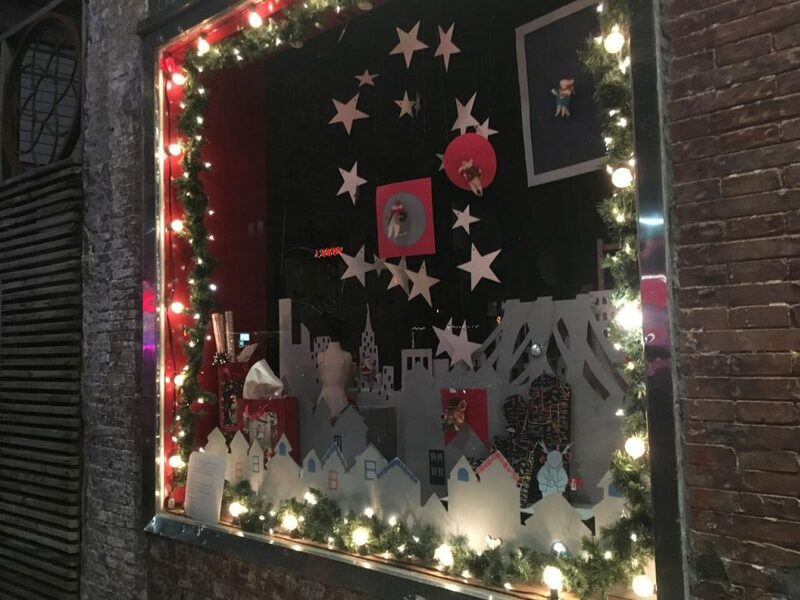 With the right lighting and accents, the “gingerbread filled” window brought the whimsical feel of Christmas eve and a sense of pride for their community. 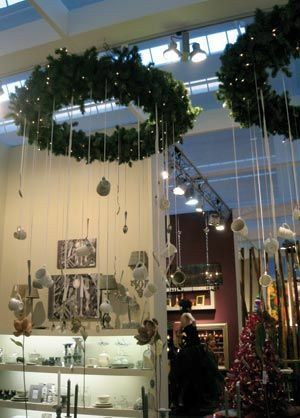 Wreaths are typically hung on doors, but this retailer used them like chandeliers and suspended ceramic mugs, cups, and other china items. Although these would probably be better hung at a higher level to avoid customers banging their heads into the display, the idea is intriguing for home goods shops. It could also be used to display toys, accessories, and other items. What retail store isn’t bulging with coat hangers? 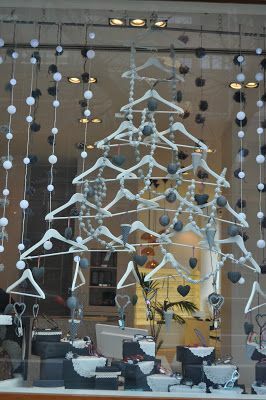 This coat hanger tree uses plain wooden hangers spray-painted white and glued into place to create a tree-effect. 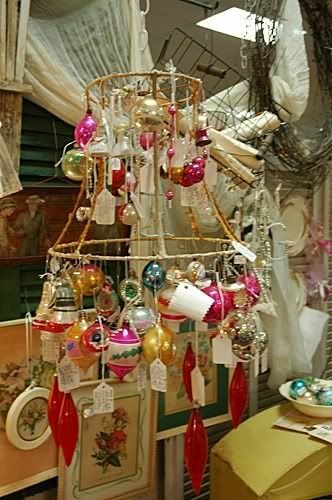 Although this retailer did not hang the jewelry from the tree, it would make an adorable display for costume necklaces, fashion scarves, and other small items. Display props and good merchandising don’t need to be expensive. 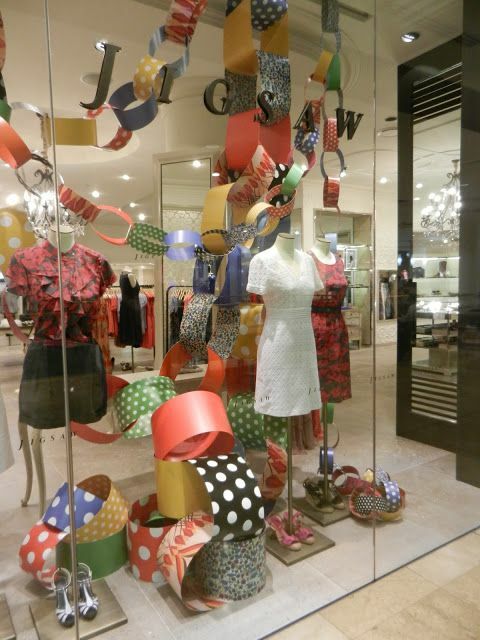 This store window display showcases women’s fashions with paper chains, hat boxes, and giant paper curls. You can make something similar using Christmas-themed wrapping paper and craft supplies purchased inexpensively from a local retailer. 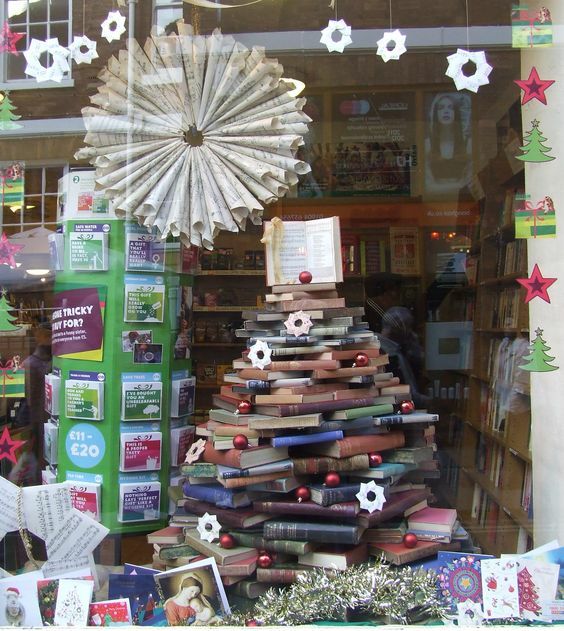 This book shop used its own products to make a ‘book tree.’ Pages from old (we hope, worn out) books were used to form paper wreaths hanging in the window. The entire display speaks of old-world charm while showcasing the store’s theme and products. 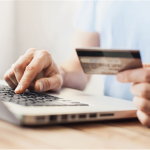 Card and gift retailers and those with temporary Christmas stores may scramble for display space and shelving to get all of their products out for purchase. This store used a simple red ladder (you probably already have a ladder in your back office which you can paint), with spray-painted boards affixed between the rungs and covered with acrylic snow, to show a collection of snowglobes, lighted houses, and other Christmas treasures for purchase. 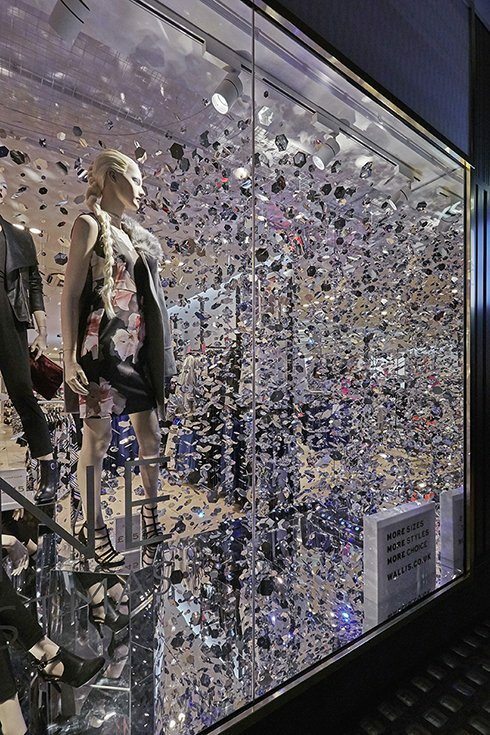 This eye-catching window display was created so simply it makes you wonder why you never thought of it. The red mailbox features a tumble of letters, glued together or affixed to thin wires or cardboard, to form a cascade of mail for Santa Claus. 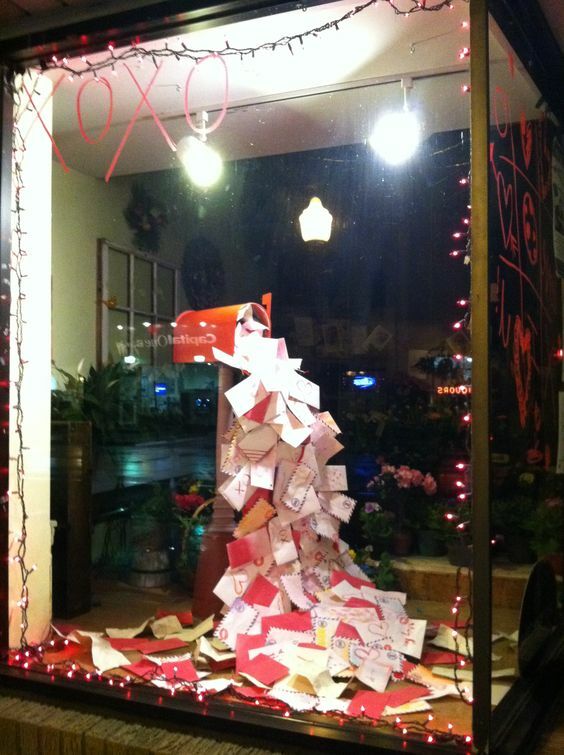 You could use this idea inside your store to attract customers to a display as a window display, as this retailer did. This store used a technique of grouping products into sets of three to add visual interest and appeal. The tabletop display of china and home goods is inviting enough that it tempts shoppers to come over and explore the wares, while colorful with holiday greenery and red and green candies. The candlesticks and other items are grouped in threes, an odd number that is visually appealing. Regulations typically prevent retails shops from having a real fireplace. So what do you do? 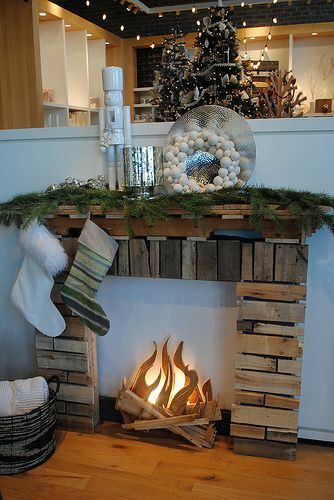 Construct a faux fireplace as part of your store display. Wooden stick-on tiles are placed over a cardboard box fireplace frame, with a light and cardboard ‘flames’ below. 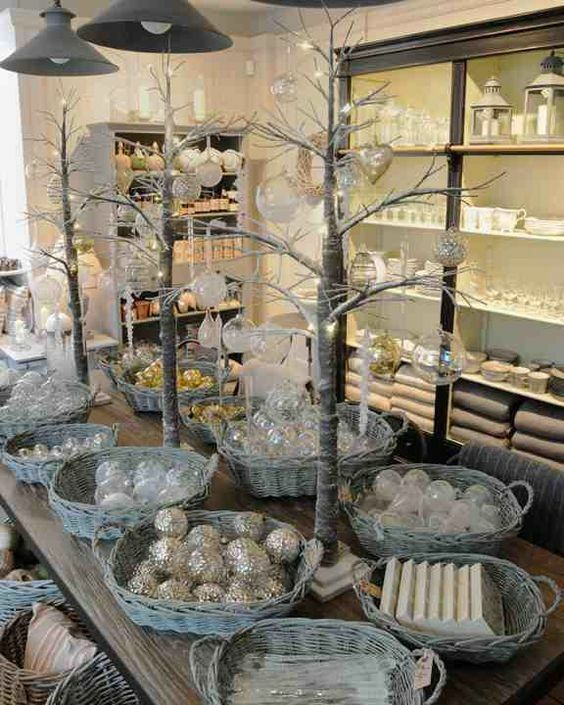 White-painted ornaments and others minimalist decorations give this display a Scandinavian feel. Ornaments are often difficult to display in a retail setting. 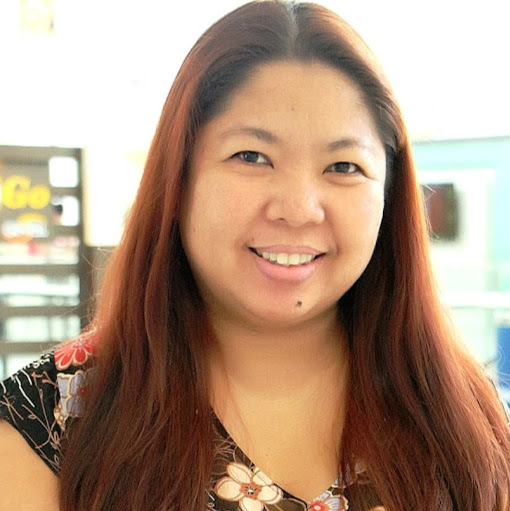 Customers are reluctant to pick them off of a tree, or they can get tangled in branches. 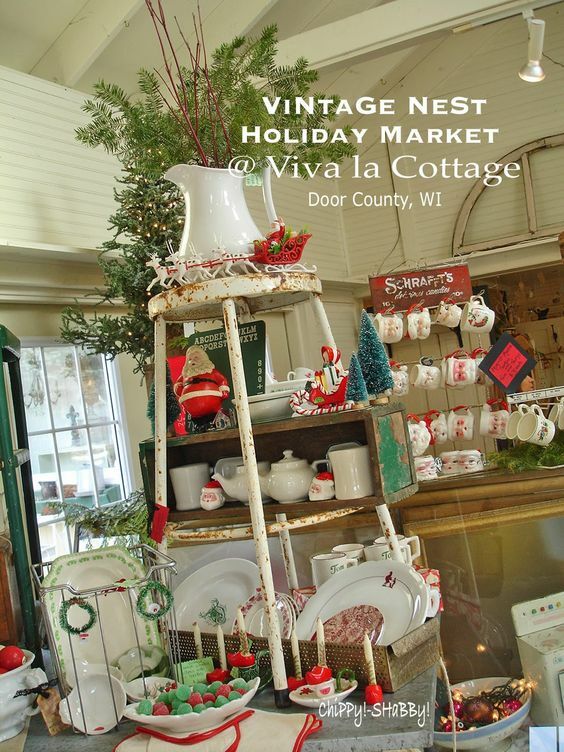 This form, made from either a wire or branch frame, layers two tiers of ornaments for easy shopping. It also showcases them nicely so that shoppers can clearly see all sides of the ornaments while making an attractive and enticing display. Birch branches and silver-painted baskets transform a plain tabletop into a winter wonderland. Baskets house ornaments and other items for sale neatly on the tabletop, while inset shelves filled with white china, linens, and other home items are neatly arrayed in the back. It’s a lovely, understated holiday theme that can be left up past the New Year for a winter time theme with minimal changes. 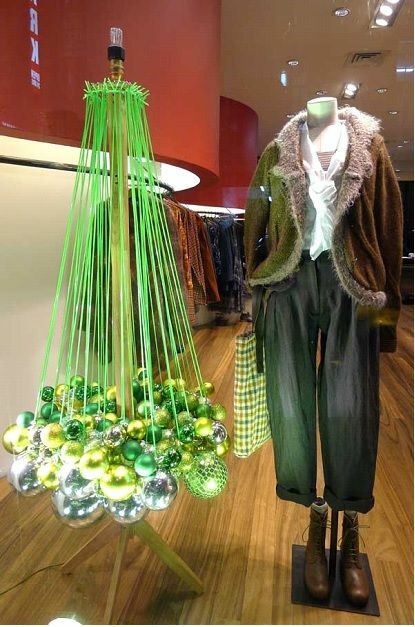 Mix things up and think outside the box: Don’t just put leaves on your trees, put them on your mannequins! 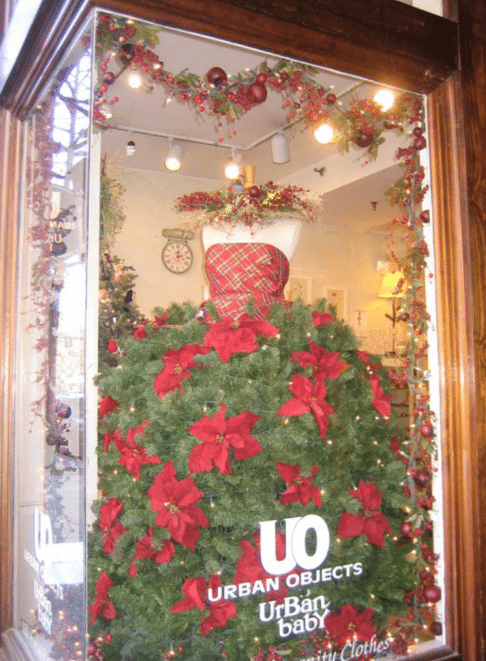 Dress your mannequins in beautiful holiday gowns made of greenery, ornaments, and ribbon. From elaborate skirts to short contemporary styles, your only limit is your imagination. This is also a wonderful way to have the smell of fresh pine in your store without the hassle of a tree. 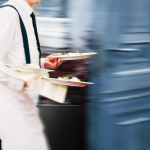 How will you transform your store, restaurant, or business this holiday season? A little spray paint, clever repurposed items used as props, and repetition in color, line, and form make these Christmas display ideas attractive as well as useful.